We’re working hard to make it easier for you to share and discover great outdoor adventures with ViewRanger. Yesterday we released all-new track pages at my.viewranger.com that use your recorded gps tracks to showcase your outdoor adventures, including highlighting geotagged photos and tweets, photo lightbox, and more track stats. We also released ViewRanger V4.1 for Android with our new Trip Sharing feature that makes it simple to share your live BuddyBeacon map, track maps, and routes via twitter, facebook, email and more, directly from within the app. Today we have launched the ViewRanger Activity Feed in Android, Apple, and Blackberry apps, to make it easier to follow the adventures of your friends, discover the latest routes created by your favourite publishers, and more. 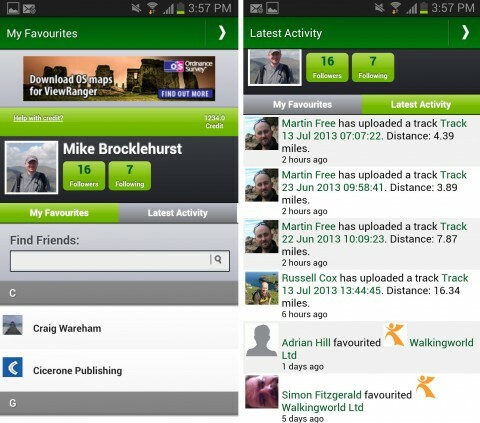 The Activity Feed shows the latest updates for ViewRanger users you Follow (or Favourite). It will show you when they publish new routes. It will show you the latest recorded gps tracks that they have shared. It will tell you when you can follow them live – via BuddyBeacon – when they are out exploring. A simple tap on the activity item will open that route in your ViewRanger app, show your friend’s latest BuddyBeacon position on your map, or let you see and comment on their latest recorded adventures. You'll see "Favourite" button at the top of a user's profile page within the app. Simply tap on this button. You can search for Friends who are also using ViewRanger. From the menu, tap on Favourites, then enter your friends name or email address in the search box. Tap on their name to see their profile page (including their latest routes and shared tracks, then on "Favourite". Many publishing brands, events, and other organizations use ViewRanger to make their trail guide content available for download. You can follow these brands too - and when they publish new trail guides, these will show up in your Activity Feed. 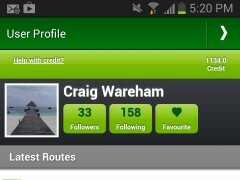 Similarly, you'll see "Add to Favourites" button on user profile pages on the my.viewranger website. Once you've added them, then activity that they share will appear in your Activity Feed.